LONDON, ENGLAND, GREAT BRITAIN, March 9, 2017 /EINPresswire.com/ -- SudhirChoudhrieBook.com released this new book From My Heart: A Tale of Life, Love and Destiny which is an inspiring story of family love and human survival. A powerful tale of hope for heart patients everywhere, bringing awareness to organ donation across the globe. The book was written by successful entrepreneur, philanthropist, and International Best Selling Author, Sudhir Choudhrie. 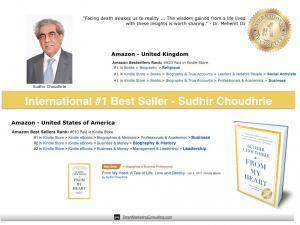 Sudhir Choudhrie’s new Amazon International #1 bestselling book, From My Heart is available in the Amazon marketplace as an ebook and hardcover. From My Heart has proven to be very popular since its release, achieving #1 Best Seller in multiple categories in United Kingdom and the United States of America Amazon marketplace. The book is available in hardcover by visiting Amazon. 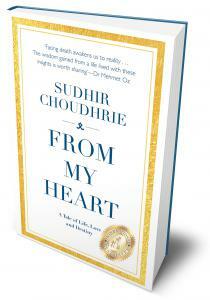 From My Heart is a memoir which walks the reader through Choudhrie’s greatest achievement - to still be alive. What's more, he is living with purpose to focus on family and personal growth. Sudhir Choudhrie knows better than most the meaning of survival against the odds. His story is one of perseverance and survival. Born in India, he has become an internationally recognized figure, renowned for his business successes and philanthropic good will across the globe. Lesser known are the difficulties which he has faced throughout his life, with his, and his family's health. After years of ill health, he had a heart transplant operation just eight months after the death of his beloved brother Rajiv, also from a chronic heart condition. From My Heart tells the story of growing up in a privileged Indian family but knowing since early childhood that the heart Sudhir Choudhrie was born with would one day fail him. Along the way he faced numerous health problems, including a profoundly frightening period of temporary blindness, before finally being given a new heart by the world renowned surgeon Dr Oz. This is the moving story of survival, hope and second chances, a story told from the heart. The reader cannot help but be drawn into this heartfelt tale of love, loss and everything in between. Sudhir Choudhrie is a pioneering and successful entrepreneur who has played an active role in international commerce, diplomacy, philanthropy and politics. Born and educated in India, Sudhir is now living in the UK and became a British national in 2010. He is married to Anita, and has two children, Bhanu and Dhairya. Throughout his business career Sudhir has established a strong reputation for facilitating the growth of the companies he invests in, helping to broker strategic partnerships and cross border investment. Following a successful heart transplant operation in 1999, Choudhrie became major benefactor of the Columbia University Medical Center in New York, where a professorship in Cardiology and student lounge have since been established in his name.